Richard Stack is a professor in the School of Communication at American University. The book contains a foreword by Benjamin Todd Jealous. 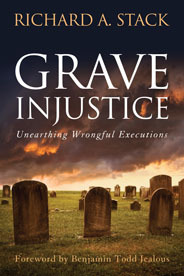 (R. Stack, "Grave Injustice: Unearthing Wrongful Executions," Potomac Books, 2013; DPIC posted Sept. 26, 2013). See Innocence and Books.